Shotton chose Claude Willoughby, a 31-year-old right-hander, to start the game of May 22. Willoughby had compiled a 15-14 record in 1929, but he was off to a poor start in 1930, with an 11.17 ERA in five appearances. To thwart O’Doul, Klein, and Hurst, all left-handed batters, Giants manager John McGraw selected Bill Walker, a 26-year-old southpaw whose 3.09 ERA had led the National League in 1929. An estimated 5,000 fans attended the Thursday afternoon contest at the Polo Grounds in New York. After a scoreless first inning, the Phillies got on the board in the top of the second when Hurst homered with a man on. Mel Ott, the Giants’ 21-year-old sensation, led off the bottom half by doubling into the left-field corner, and he scored on Bob O’Farrell’s single. In the third inning, O’Doul slugged a two-run homer for the Phillies, and Bill Terry’s sacrifice fly brought one in for the Giants. In the fifth, Freddy Leach clubbed a two-run homer for the Giants to even the score at 4-4. The Phillies retook the lead in the sixth by scoring twice on three hits and an error. Klein led off the seventh with an apparent double but was called out for failing to touch first base, a mistake that would cost the Phillies a run. Pinkey Whitney followed with a double, and Hurst’s single drove in Whitney and sent Walker to the showers. But the Giants kept coming back. After Terry’s triple in the eighth, Ott clouted a two-run homer, and the Phillies’ lead was cut to 7-6. In the top of the ninth, the Phillies gained an insurance run from a walk and two singles off rookie pitcher Ray Lucas. The Giants batted against Willoughby in the bottom of the ninth trailing by two runs. Rookie Eddie Marshall singled to lead off, but Shanty Hogan flied out and Leach struck out. The Giants were down to their last out when Freddie Lindstrom stepped to the plate. A right-handed batter, Lindstrom lined the ball off the parapet of the left-field roof for a dramatic two-run homer. The game went to extra innings deadlocked at 8-8. Tommy Thevenow singled, Klein doubled, and Whitney drew a walk to load the bases, but Mitchell fanned Hurst to get out of the jam. Ott led off the bottom of the 10th inning with a walk, convincing Shotton to replace Willoughby with rookie Earl “Hap” Collard, a 31-year-old right-hander. Collard was effective, retiring the next three hitters. Fresco Thompson laced a triple to the right-center field gap to start the top of the 11th inning. He could not advance on Spud Davis’s groundout, but he tagged up and headed home on Collard’s fly out to Leach in left field. Leach’s throw home was on the mark and catcher O’Farrell applied the tag for a nifty double play. Collard retired the Giants in order in the bottom half. The blast was Klein’s 11th home run of the season. Lindstrom led off the bottom of the 12th inning with a single. Terry flied out and Ott drew a walk. Hurst nabbed Pat Crawford’s sharp grounder at first base for the second out, and the runners moved up a base. With two outs and two men in scoring position, O’Farrell drove the ball to deep left field. At first the crowd cheered what looked to be a game-winning three-run homer, but O’Doul raced back and caught it near the outfield wall to end the game. The final score was Phillies 10, Giants 8. The winning pitcher was Collard and the loser was Mitchell. The slugfest featured six home runs, two triples, and five doubles. No doubt, the Phillies could hit. Klein finished the season with a .386 batting average, 40 home runs, and 170 RBIs. 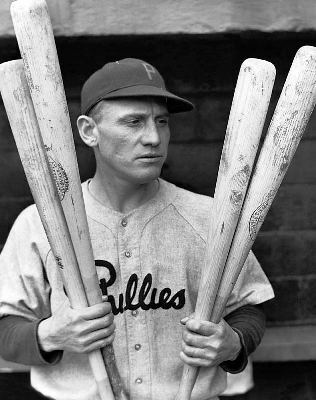 But the 6.71 team ERA doomed the 1930 Phillies to a last-place finish in the National League. The author relied on the game accounts in the May 23, 1930, issues of the Philadelphia Inquirer, New York Times, and Reading (Pennsylvania) Times. 1 Computed by the author from box scores, through games of May 21, 1930. 2 The other three legal spitballers in 1930 were Burleigh Grimes, Red Faber, and Jack Quinn. 3 Reading (PA) Times, May 23, 1930.